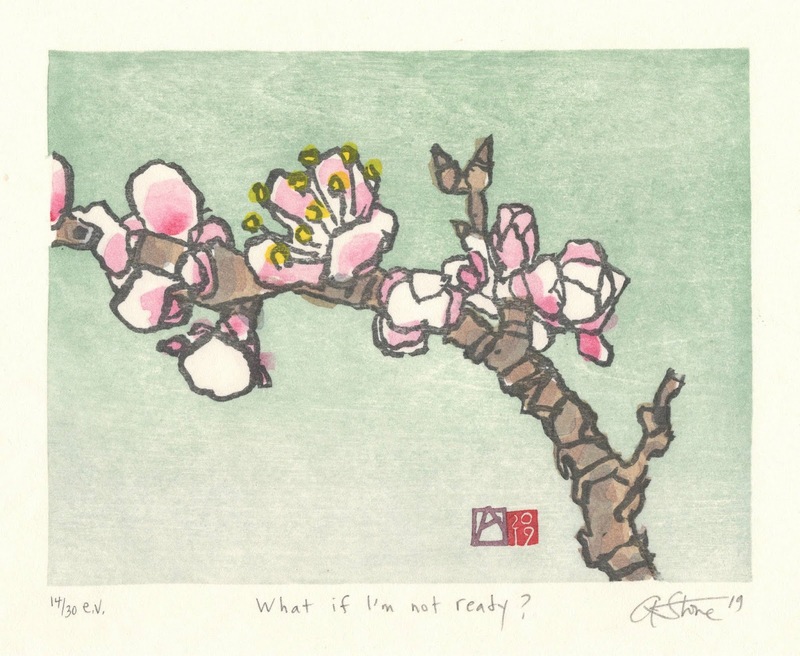 I have just returned from a one-month artist residency in Tokyo, Japan. 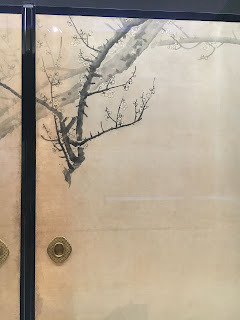 Along with fellow mokuhanga artists Mara Cozzolino, Laura Boswell and Paul Furneaux, we were group participants in ArtsChiyoda3331's joint residency, sharing an apartment and a large studio space in the antique books section of Tokyo--- Jimbocho. 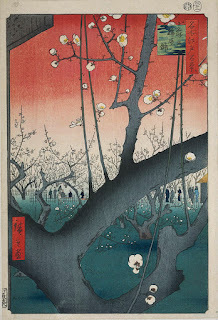 It was a paradise for mokuhanga artists; there were antique Ukiyo-e prints in the book shops, Ukiyo-e prints in the museums, and we had contacts and lists of artists, material suppliers and shops, and craftsmen making tools, paper, blocks, sharpening stones and more. I wasn't sure what I was going to work on-but I wanted it to have a subject that would tie in with my presence in Japan, but still reflect my artistic interests of etegami and woodblock prints. 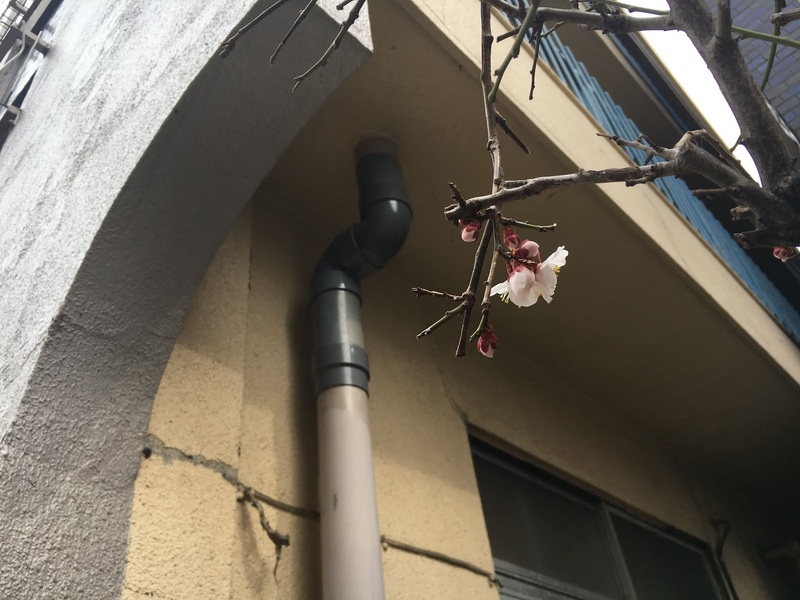 While all Tokyo and much of Japan was eagerly awaiting the Sakura blossoms--the cherry blooms. 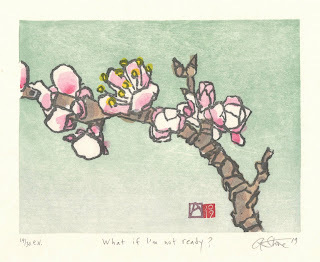 I was carrying a drawing I did this time LAST year, of an old, stunted plum tree, in bud and starting to flower. That drawing was an etegami--a loose sumi ink brush drawing to which watercolors were added and then text. 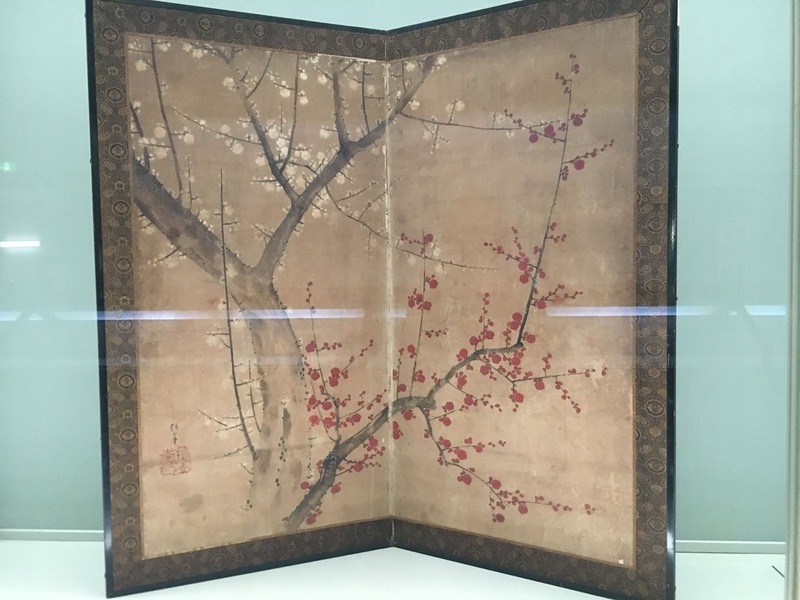 And since along with the Japanese Quince, the plums are among the first of the blooms to open, they were blooming when I left Florence, and I found them blooming--in lots of places in Japan too. 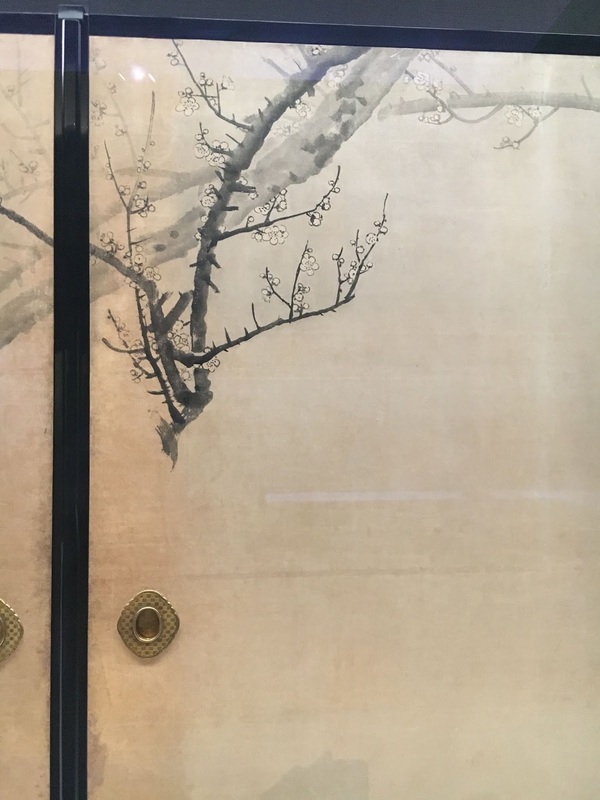 On my first morning in Tokyo, I found them on the way to Ueno park in a streetside garden, I found them again, on a scroll in a shop selling calligraphy supplies, and I found them again inside the museum, depicted over and over again. So I was happy to throw myself into this long and noble tradition. 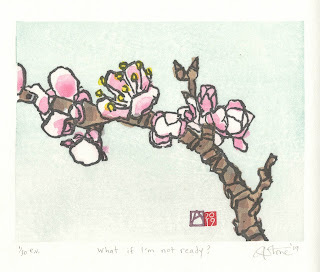 This is the original drawing/etegami from which I created the resulting print. I added the background and there is some variation in color and gradation intensity across the 30 print edition. 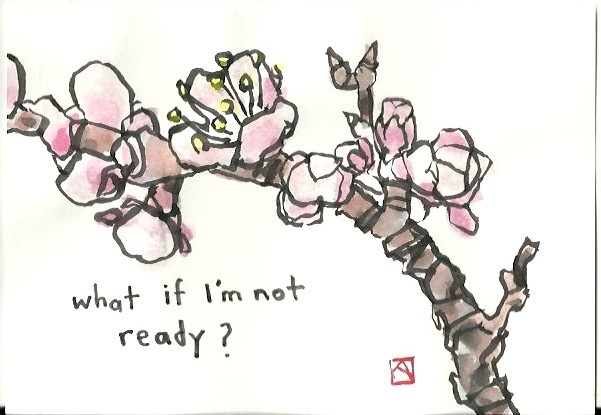 "What if I'm not ready?" 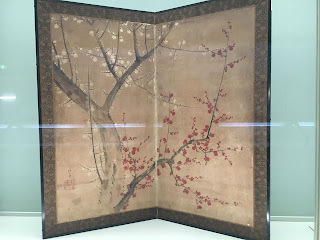 12 layers of color with watercolor, sumi ink and rice paste on mixed Japanese papers.